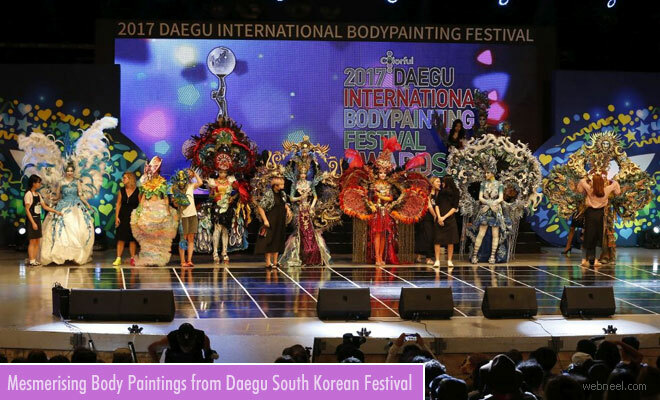 Talented body painters transformed the models into living canvases at a festival in Daegu, South Korea with thier delicate brush strokes and flamboyant illustrations covering their skin. Artists from around the world descended on the city for the event. With dazzling body art the models mersmerised the audience with the paintings of top artists across the world. The models feel that the paintings almost made them comfortable as if they are wearing clothes around their body. The artists, who competed for cash prizes, were judged on a range of criteria including the use of color, painting techniques and originality.